The Skewb is a cube that moves the way you wouldn’t expect it to. It’s a recipe for hours of "How does it move like that?" fun! The name comes "Skew" and "Cube" (how it moves, and what it is). 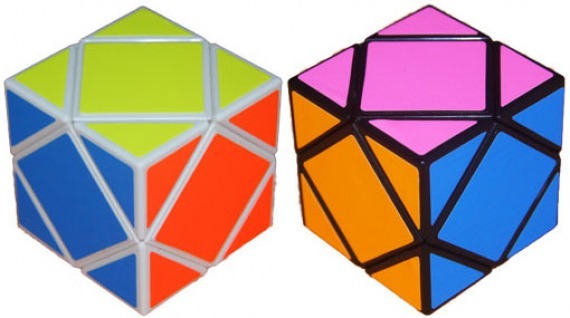 To operate the Skewb you can twist half of it through 120?X. Each half rotates around the line between opposite corners. The Skewb moves a group of three mid-faces and four corners through 120?X by rotating around the corner at the center of the group. It has precision injection molded parts with spring-loaded bearings which make operation easy and exact. The idea of the puzzle is to scramble the colors and then return them to the initial state of six single-colored sides. There are 37,791,360 possible positions of the Skewb. It is theoretically possible to solve it in 10 or less moves. The Skewb is difficult enough to be a real challenge, but easy enough to master, without help, in a few days. Just in case you do have difficulty in solving the Skewb, a solution booklet is included with the puzzle.